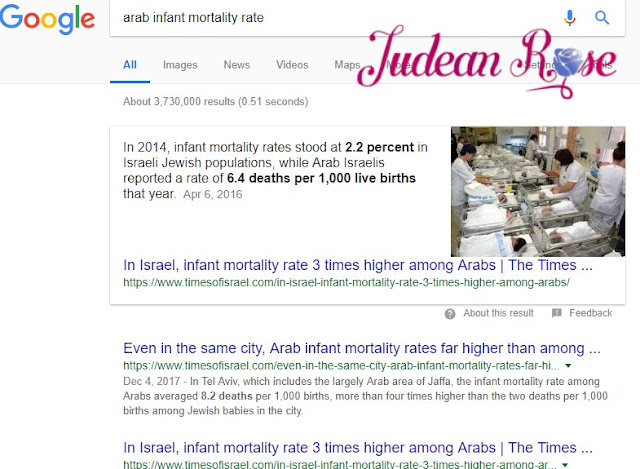 Google the phrase “arab infant mortality rate” and step into Wonderland gone wrong. 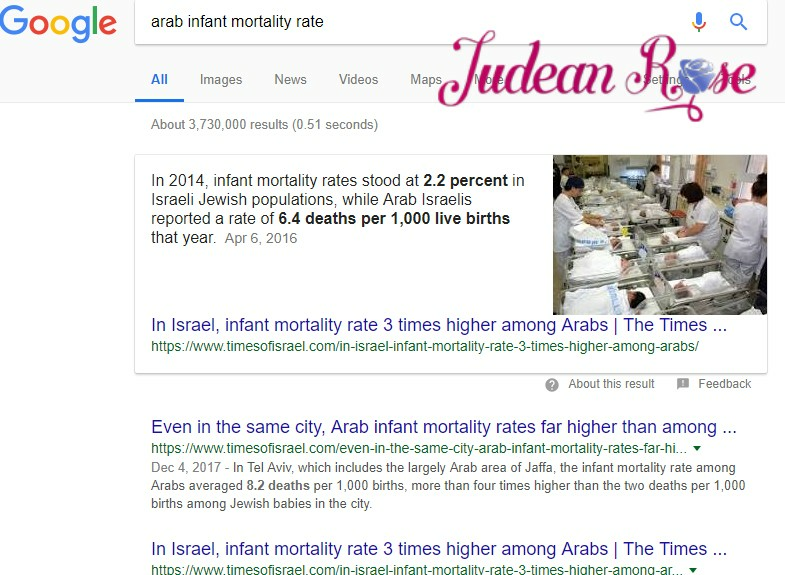 The featured snippet is from a Times of Israel piece: “In Israel, infant mortality rate 3 times higher among Arabs.” Based on the title alone, without further investigation, who wouldn’t curse a blue streak, damning Israel to hell for its villainy against the Arab people—damning Israelis as baby killers? Unless you were a thinking person, that is, who knows better than to accept what the Times of Israel wants you to believe about the disparity between the Arab and Israeli infant mortality rates. If you were a thinking person, you’d look to confirm the statistic. And assuming it were true, well then you’d want to know the context. But of course, it’s ever so much easier to blame Israel. Or alternatively, the “occupation,” another thing you might read about in the media and accept as true without a second thought. After all, you think, a news site wouldn’t print something untrue. They’d get caught. They’d lose credibility, you are sure. And so you believe what you read. That’s if you’re a regular joe. But what if you were someone who lived in the ivory towers of academia? Someone with a higher education who had successfully defended a PhD thesis, someone entrusted with teaching young students. Wouldn’t such a person know better than to accept at face value what he or she reads in the news? Wouldn’t a college professor be aware, when reading a title like that in the Times of Israel, or a similar one in Haaretz, “Huge disparities between Israeli Palestinian health systems,” that media bias may be in play here? When the title contains such a glaring smear, thinking people are supposed to stop short and think: wait a second—is that really the whole story? Often it is not. As in this case. But we’ll get to that in a minute. Since Peterson and Cheney-Lippold first agreed to the recommendations and then backed off, giving the same reason for their refusal, one has to assume that someone got to them. Someone recited a lot of crap about Israel at them and they swallowed it whole without bothering to check whether or not the tales had merit. Who knows why they believed what they were told? Perhaps they were frightened. But a closer look at the facts would have yielded a quite different picture of Israel, in particular as regards the disparity in the Arab infant mortality rate. The reason for the gap, according to Health Ministry officials, is the high rate of congenital defects and genetic diseases among babies in the Arab population. One of the main reasons for that is cousin marriages. Another reason is that Arab parents tend not to terminate the pregnancy in case of a defect or disease detected in the fetus. In addition, Arab women usually give birth at a very early age (below 20), and are therefore more prone to complications compared to Jewish women. "We encourage the Arab population to take folic acid which helps prevent congenital defects, and in (the southern predominantly Bedouin city of) Rahat we subsidize the addition of folic acid in bakeries," said Prof. Itamar Grotto, head of public health disease prevention and health promotion at the Health Ministry. "In addition, several vaccinations have been added to the health basket in recent years, and the response in the Arab population has been very high. We expect it to reduce the mortality rate." To summarize, the factors that have tripled the Arab infant mortality rate in comparison with that of Jewish Israelis are Arab consanguinity; the Arab refusal to terminate pregnancies gone wrong; and the Arab propensity for marrying off underage girls, which dooms them to high risk pregnancies. In other words, it is the Arabs who are responsible for the disparity in Israel’s mortality rates. Far from being the villain in the story, Israel’s health ministry has tasked itself with addressing the disparity through measures offered only to the Arab population such as adding folic acid to baked goods produced in the Bedouin-only town of Rahat. Folic acid, taken during pregnancy, is known to prevent neural tube defects. But if Mohammed won’t come to the mountain, and Arab women won’t take supplements, the supplements come to them, courtesy of the Israeli government. They get the goodness baked straight into their baked goods. Israel is actually protecting Arab pregnancies, ensuring that Arab babies live (to grow up and hate the Jews, in all too many cases). But this too, is not the whole story. The Arab mortality rate has well nigh plummeted since the Six-Day War in 1967. But don’t take it from me. Take it from Al-Najah University's Dr. Wael R. Ennab, a consultant with UNCTAD. According to Ennab, in a paper he published in 1994, the Arab infant mortality rate in 1967 was between 152-162 per 1,000 live births. By 1974, infant mortality had seen a slight improvement of 132 per 1,000 live births. By 1985 the infant mortality rate had dropped to an incredible 53-56 per 1,000 live births. And by the time the Oslo Accords were signed, in 1993, the infant mortality rate had dropped to 30. That’s flipping INCREDIBLE. That is what Israel has accomplished for its Arab population. Even though Israel is demonized by the whole world as some kind of monster, a baby-killer who oppresses the Arab people. Even as we have Arabs attacking us in malls, on buses, and in the streets. With rocks, knives, car-rammings, bombs, axes, Molotov balloons, and missiles. Still, the Israeli government has fought to drop the Arab mortality rate from 152-162 to just 6.4 deaths per 1,000 live births in the 51 years since we won the war. That’s on us. On Israel! And it’s on you if you report that out of context. Or believe the lie that Israel is the villain, when actually, Israel is the hero in the story of Arab infant mortality. You don’t have to believe what you read. Especially when you’re a Cheney-Lippold or a Peterson. Someone with a higher education. Someone responsible for young minds. It’s a choice to accept the stats without context and to regurgitate them to your students. To use them to hurt and wound. To demonize the hero. This is an evil of great proportions. A lie that covers an uncommon good in our contemporary world: the good of Israel and its exceptionally good governance. Here is the truth: The Jewish State deserves the widest recognition possible for protecting and nurturing its largest minority population, a sector that is overwhelmingly hostile to Israel and the Jewish people. Israel’s methodology for lowering the Arab population’s infant mortality rate is one that might well be emulated throughout the Arab world and studied in the halls of academia. If only we could find an honest teacher.